Why choose PolyesPro® Pipe Marking? Our clients wanted to be able to mark pipes with a material that had a high degree of temperature resistance, a long lifespan (ten years plus) and that retained the colours of the markings (colourfastness). 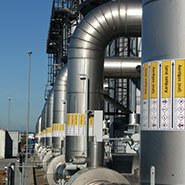 To meet that need, Blomsma Signs & Safety worked closely with 3M to develop its own product line for marking and labelling pipes, PolyesPro® pipe markings. After numerous production tests and field tests against the required quality criteria, the product is now available. With all the usual 3M guarantees. Download the PolyesPro® datasheet here or go directly to the official website of PolyesPro®. PolyesPro® pipe marking is produced using the 3M™ MCS™ or Matched Component System. It comprises a sandwich of polyester base material that the image is printed on, finished with a protective polyester laminate. The base material has a halogen-free adhesive backing that makes it suitable for applying to stainless steel piping as well. The protective properties of the polyester laminate, such as resistance to UV and numerous chemicals, guarantee a long service life. PolyesPro® also does not contain PVC (vinyl chlorides). 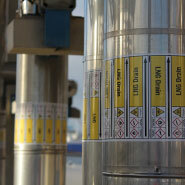 Our flexible production process makes any layout and combination of safety symbols possible (according to GHS and ISO7010), as well as integration of additional information such as pipeline numbers, to and from indicators, and any other system information desired. We manufacture the markings and labels in accordance with all the applicable national and international rules & regulations and norms as well as your company standards. The rolls are supplied in handy dimensions for efficient and economical use. Our PolyesPro® pipeline markings have a number of unique features that have been made possible by the 3M™’s latest innovations in adhesives and colourfastness. The key feature is a fluid acryl-based adhesive layer over 120 microns thick. This allows the labels to be applied to almost all types of lines, even painted ones with a slight texture. Using 3M™ configured machinery and 3M™ inks ensures exceptionally long-lasting colourfastness of the image. This means that high-quality information transfer is assured; the markings remain legible and recognisable in terms of both the colour and the safety symbols used. The scope of applicability is very wide-ranging, from the offshore and marine markets to chemical and petrochemical plants and tank terminals. 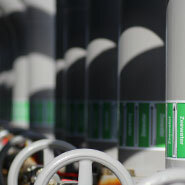 Our PolyesPro® pipeline markings are of course UV-resistant, scratch-resistant and able to withstand extreme weather conditions and chemicals. 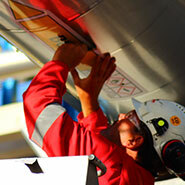 PolyesPro® markings can be applied on insulated pipes, painted pipes and stainless steel pipes. Inadequate or insufficient labeling of pipes is contrary to current legislation. When the contents of pipelines are unknown, this poses great risks to workers, visitors and emergency services. It must therefore be assumed that this information is always available: recognizable and readable. However, there are several factors that can lead to quality problems with pipe marking. Factors that affect not only the quality of pipe marking but also the effect of the pipe marking on your piping itself. In our white paper we explain the most common problems and how to prevent them. Our white paper “Pipe marking – Quality aspects for reliable information transfer” is available for download here.